School libraries are great places to find a good book, but they are much more than that. That is why, in North Carolina, each school media center is staffed with a certified school librarian. Here at Mills Park Middle, as the largest middle school in North Carolina, we're fortunate enough to have two teacher librarians. How did the Media Center teachers help with your education this year? Gave us computer access, provided us with books, and gave good internet safety tips. They showed us resources and put together so many amazing things. They helped me find new books, film and edit green screen videos and recommend FANTASTIC books! The media center teachers really helped me navigate the library and made it a fun place to be in. They helped us find resources in science class and edit our language arts videos. I had some great talks and got some good book recommendations. You helped me cite the websites I used and helped me look at books in a whole different way! 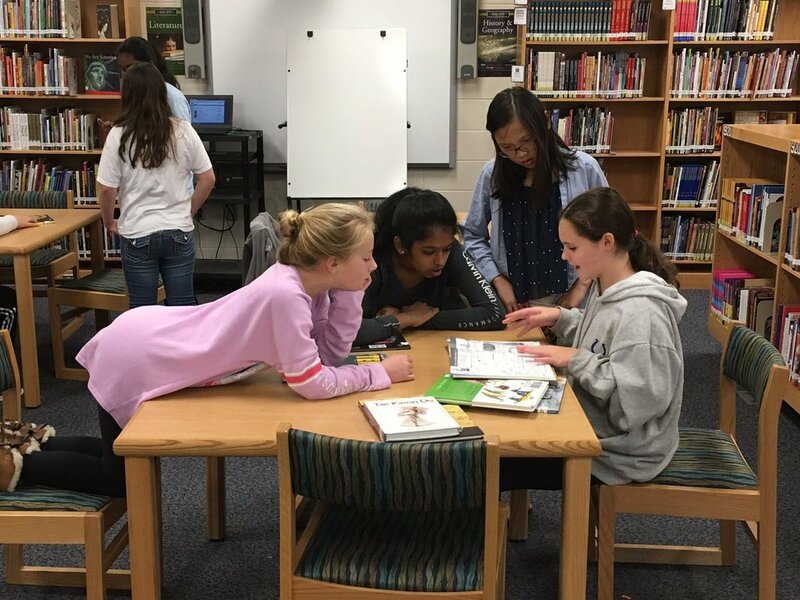 Students also gave us some great suggestions about improving the media center for next year: adding more contests, ideas for book displays, even getting a library dog (sorry, but that last one's not going to happen!) We're always looking for ways to improve and ideas for updating and making what we do even better. Our students just participated in Book March Madness, an annual bracket-style tournament in which books compete against other books to determine a champion. 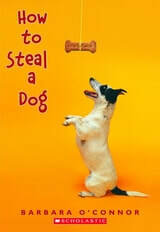 MPMS’s winner for this school year is How to Steal a Dog by Barbara O’Connor, with Refugee by Alan Gratz coming in a very close second. The concept of Book March Madness sprung forth from the collaboration of two teachers based in Ohio. Each Fall, the teachers pick 16 recently published books based upon a particular theme of their choosing for tournament competition. Bracket placement is done by drawing book titles out of a bowl. Some schools conduct similar tournaments with their own twist. For example, the librarians may choose to pick their own 16 book titles. Or, instead of having books compete against each other, it may be books vs. their movie adaptations, or book villains vs. book heroines. No matter how the competition’s structured, all students are winners by being exposed to different book titles! ​Over the past couple of weeks we've received about 225 new books, with more to come. Did you know that, according to School Library Journal, the average cost per hardback book for a school library is around $20? 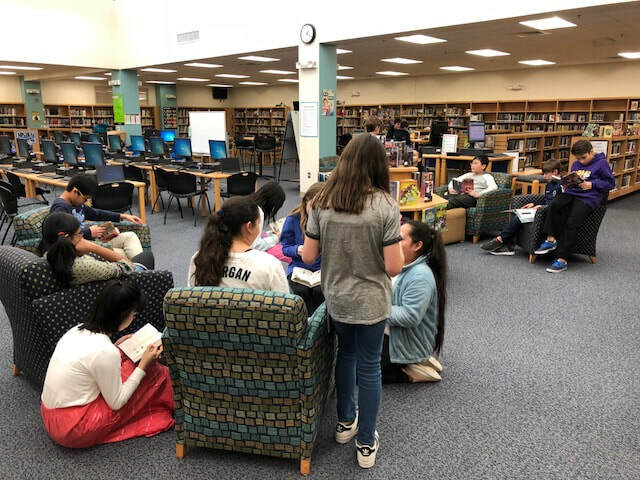 We are fortunate here at MPMS to have a healthy book budget and each year we're able to add several hundred books to the media center book collection. Here are answers to some questions you may have. How do you select the books for the media center? We never order lists of books that have been prepared by others; instead we look at each book title individually to decide which to order. We read professional journals that include reviews and age recommendations and use these resources to guide our decisions. It's not possible to read every book in here (although it would be great to have the time for that!) so we rely on these professional reviews and mostly order books that have received "starred" reviews. We also take a lot of student suggestions. We consider every student request and, as long as it adheres to our age and quality guidelines, we usually can order these requested books. What criteria do you use to decide if a book should be in the media center? We serve all 1700+ students at MPMS and our books reflect that. Our students range in age, reading ability, maturity level, and interests. The books we have offer something for everyone. That being said, not every book in the media center is the right book, right now, for every student. We teach kids to choose literature for themselves, and help them if they need it. If there are 30 students waiting to read The Sea of Monsters, how many copies do your order*? Ok, no one has ever actually asked that question but it's a hard one! We teeter between giving students what they want (especially if the book is hugely popular) and not over-buying books that won't be so popular in the future. We also make sure we have the best-written books (classics and award winners), books that fit with our students' reading interests (lots of science fiction here at MP, not so much historical fiction), and also buy widely diverse books so all students can "see" themselves in characters and stories. ​​*Once 6th graders all read The Lightning Thief in language arts class, there actually were at least 30 kids waiting to read The Sea of Monsters. Thanks to Mrs. Shelton's donation of several copies and the purchase of a few more, everyone who had their names on the reserve list have been able to find out what happened to Percy Jackson and were able to move on to The Titan's Curse. Survivors endure many obstacles for the betterment of others. People take risks for a variety of reasons and risk taking behavior often can isolate a person. An author's choice of words are indicative of his perspective and purpose for writing. Authors use many different text structures within a text for specific reasons and purposes. Effective arguments have a claim that is substantiated by relevant evidence and logical reasoning. What does it take to be a survivor? What causes people to take risks? What makes some take risks and others not? How do authors develop points of view? How does word choice affect tone, meaning and mood? How does text structure impact the development of ideas and meaning? How are effective arguments with sound reasoning and sufficient evidence developed and delivered? The Language Arts teachers have taken these and created a unit that encompasses nonfiction books, research, writing, reading a fiction book, and much more. Students learned the important elements on informational (nonfiction) books: things like table of contents, headings, maps, charts, and timelines. They chose their own topic that tied into the theme of survival (how to survive a hurricane, how to survive wearing braces, etc.) and conducted research using our reference databases and an educational search engine. In this part of the unit they learned how to choose and use good resources, take notes, and cite sources. They created a Survival Guide on their topic, and it had to include those same components that their nonfiction books did. All this will lead into a novel study of the book Peak, by Roland Smith, a story about scaling Mt. Everest. 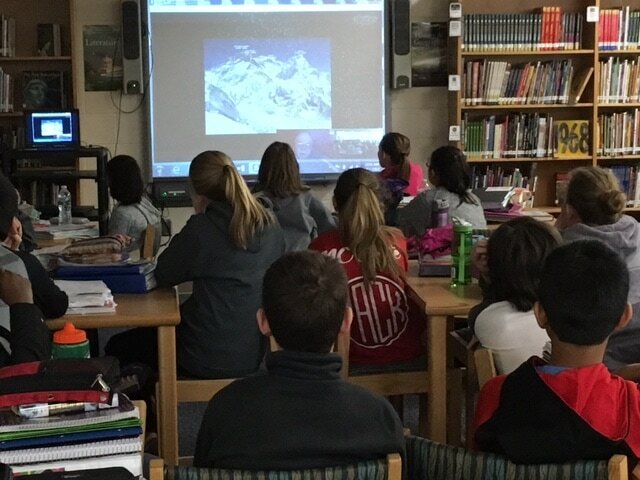 Ms. Brooks' students got to be part of a Skype visit by Alan Arnette, and mountain climber who made it to the summit of Everest, and next week will Skype with Gordon Janow, another Everest climber. Using these kinds of learning experiences adds depth to the unit, much more than using only fact-learning, reading, and writing would. These, of course, do make up a large part of the unit, but the extensions and digital components increase knowledge and motivation. The teachers here at MPMS are the best, when it comes to designing units that teach the content but ask much more of the students that regurgitating facts or completing a multiple choice test. Ask your 6th grader about their survival project and you'll see how engaged they've been throughout the unit. It was a little delayed, thanks to the snow days, but this week is the culminating activity as our 8th Graders participate in the NC Science and Engineering Fair.​ For months now, students have chosen a topic, formulated a hypothesis, done research, conducted an experiment, and analyzed their results. Projects are being judged now, and the top ones will move on to a regional competition. Ms. Aticila Mormondo, 8th grade science teacher, is passionate about the use of technology in science education, and is a leader in her field. She recently published an article in Pure American Digital Magazine called BYOD Initiative: Effective Use of Technology in the Classroom. In the article, she tells about projects her students have done using access to technology as they critically examine information on topics like biotechnology. 8th graders should be proud of their hard work on these great projects they created. 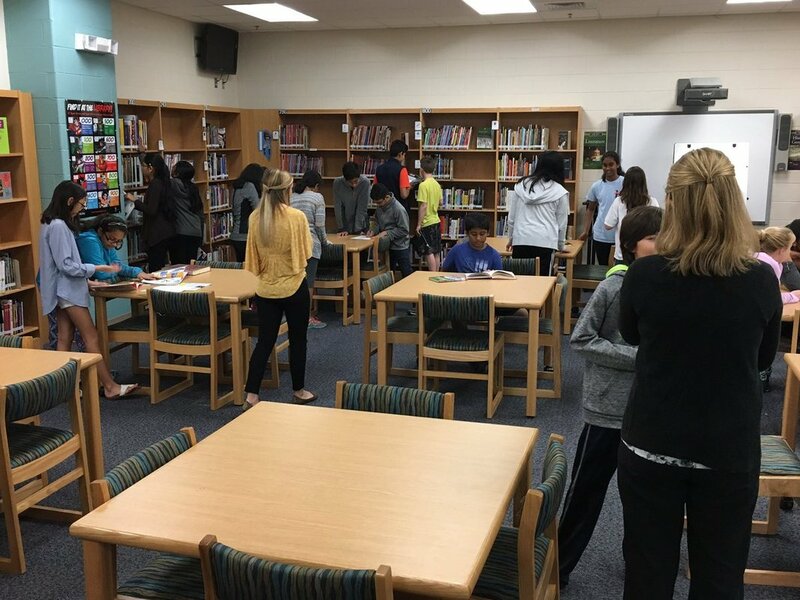 When students get to middle school, school librarians focus on skills in a different way than in elementary school. Our middle school media program is split into three parts: Literacy, Information Literacy, and Technology. The literacy part of the program is the one most people are familiar with. We've been focused, recently, on the Information Literacy skills students will need throughout their lives. Information Literacy includes research skills. There is so much out there on the Internet, and people today need to be able to find the information they need, make sense of it, and share it with others. Sixth grade science students are working on a project right now where they will learn not only the science content, but also some of these research skills. The science content of the project is on biomes and ecosystems of the world. Students will learn about biomes like rain forests, grasslands, tundra, forests, rivers, and oceans. Where Mrs. Shelton and I come in is in teaching students to find good information they can trust. If you type "rain forest," into Google, you get 51,600,000 results. Whew, that's a lot! By using subscription databases and an educational search engine, we know students will fine accurate, reliable information without having to evaluate sources and decide if they're getting good information or not. These digital resources do that for them. Also, did you know there is a rain forest in North Carolina? Neither did I! Mrs. Shelton discoved that during this project. It's a temperate rain forest (not tropical) and you can read more about it here. We'd like to give a warm welcome to Mrs. Erika Henderson, our library intern. Mrs. Henderson is finishing her master's degree in library science from UNC-CH. It's sort of like the school librarian version of student teaching. Mrs. Henderson will be here regularly until Thanksgiving, and she's already jumped in to help students find some great books. We're amazed at how many children's and young adult books she's read! She's also been teaching classes, and has developed some fantastic lessons, focusing on both literacy and research skills. For her literacy lesson, Mrs. Henderson has been going into selected 8th grade language arts classrooms and taking a Popup Library with her. She found some really engaging online book trailers (like a movie trailer, but about a book) and printed QR codes that link to the trailers. The QR codes are taped to the cover of the book. Students used school iPads and their own devices to browse around and watch the trailers. Once they found a book they'd like to read, Mrs. Henderson used an app on her phone to check the books out to students. It was a very engaging way for students to find some great literature for their next reading project. She tied it in with #weneeddiversebooks, whose mission is to make sure all children can see themselves in the pages of a book. Next week, she'll be working with 7th grade language arts classes as they begin their Infographic project about inventions and innovators. Students will learn to use databases to find the most reliable information possible about their topics. Mrs. Henderson is a busy lady! She and her husband have four children, from elementary age to high school, a dog and two kittens. She takes classes and works in the music library at Chapel Hill. We're so happy to have her with us this semester, and know she'll make a fabulous school librarian. All MPMS students will come to the media center for an orientation session. In fact, we started on Day 2 and have had between 120-250 students a day who have visited the media center to check out books, log in to the computer network, log in to their student email accounts, and log in to their Google Apps accounts. So far, all 6th grade students have been here, we are finishing with 7th grade, and 8th grade will visit next week. It brings us joy to see students leave here with stacks of books to read. So many books, so little time. Wednesday, Feb. 17 was Digital Learning Day, Digital Learning Day is a day to celebrate our instructional practices that use technology in meaningful ways. We are fortunate here at MPMS to have access to a variety of tech tools; hardware like desktop computers, laptops, and iPads, software like Sketchup, iMovie, and Google Apps for Education, and equipment like our Green Screens. The technology ties in nicely to Superintendent Merrill's Strategic Plan, which incorporates the 4 Cs: Creativity, Collaboration, Communication, and Critical Thinking. All WCPSS students have had access to Google Apps for Education (GAFE) for several months now. GAFE is a set of communication and collaboration tools that allow students to create documents, spreadsheets, presentations and more. They can work collaboratively, in real time, with others, without having to email work to one another. They can store all their work "in the cloud" so it's available from any computer or device and share it easily with others. GAFE is changing the way teachers are teaching. With Google Classroom, teachers can have a "paperless" classroom, with assignments delivered and turned in online. No more, "my dog ate my homework"! Teachers and students have become more dependent on having access to a device; like computers, iPads, and smart phones. This will tie in well with Bring Your Own Device, which is being implemented at MPMS now. --The Google Apps are an excellent learning tool. --I use Google Apps a lot to keep myself organized--and it really works! Everything about Google is amazing and awesome. --Google Drive is a good tool for sharing and storing information. It is easy to use and the interface is great. --I think Google Drive is awesome. It has many features and you can easily find files in the folders. Overall, it's one of the best tools on the Internet I've ever used. --Google Drive is a much easier tool to use rather than submitting work by hand. You don't lose things. --Google Drive's function helps us connect and share with others. It is easy to use and easy to share with others instead of using a flash drive or emailing it to others. --It's a really easy and creative way to learn and do group projects. --It's helped me a lot throughout school and is a great interactive tool. --Google Drive is a great tool for school. It saves your work automatically every few seconds, and you can access it anywhere. This is incredibly useful for school assignments and projects. I grew up in a small town in Ohio and went to school with the same one hundred kids from kindergarten through high school. My school was much smaller than Mills Park! I graduated from Duke University and continue to root for the Blue Devils. Go Duke! I majored in public policy and, after college, moved to Washington D.C. where I worked with the federal and state governments on health policy issues. Thanks to a semester abroad in college and marrying into the United States Air Force, I have had the pleasure of living in five states (Ohio, Virginia, Illinois, Colorado, and North Carolina) and three countries (United States, Scotland, and England). I love to read and will read almost any book, though I tend to prefer those that involve history (especially World War II), spies, or foreign settings. I especially love books that make me cry! Harry Potter is my favorite series and, yes, I cried while reading several of the books. In my free time, I enjoy running, yoga, and crossword puzzles. My goal is to complete a Sunday New York Times crossword without any mistakes! I also enjoy food--I like to try new ingredients, new recipes, and new restaurants. I love to bake cookies; I find it’s great stress relief (or maybe that’s just the cookie dough eating?). The most exciting thing that I’ve ever done is catch a ride on an Air Force refueling plane! These planes extend a “boom” behind them to refuel other planes while both are flying. In order to see the connection, airmen crawl into a panoramic window at the back of the refueler and they let me back to take a look. It was unforgettable! I’m excited to be working at Mills Park Middle School and look forward to getting to know you when you visit the media center. Please stop by to say hello! One of Mrs. Fiedler's areas of expertise (and she has many!) is in bringing the world to MPMS students through videoconferencing. Skype in the Classroom and Google Hangouts allow teachers to break down the walls of the classroom, opening up a world of opportunity as students connect with experts and collaborate with classes across the globe. To arrange a videoconference, we use technology (mostly the Internet, email, or social media like Twitter) to reach out to an expert in a field our students are currently studying. It's a cool way to take a virtual field trip to a place students would not be able to travel to: oceans, the arctic, museums. Students are more engaged by interacting with other people than they would be by simply reading about a topic or looking at pictures. Once we find someone willing to talk with students, we use tech tools that offer video and audio of the speaker as we project the image on a big screen. The speaker can see our students as they listen, and students learn appropriate audience behavior from these sessions. They listen politely, ask thoughtful questions, and learn to effectively communicate. ​These fantastic opportunities weren't available a few years ago. Technology like videoconferencing has changed the way we teach, and the way students learn. We've been super-busy in the media center this school year! It's easy to let the days fly by, never really knowing whether or not you're making an impact on students or the school. That's why we decided to take a few minutes (well, days really) to put together our version of the Twelve Days of Media. Now, ​how about some explanation? 208 heat tickets (and counting!) Each time a computer needs repair or reconfiguration that we can't perform at the school level, we submit a ticket to the help desk. It's time consuming, but important to keep our technology up and running. Eleven Lincolns Leaping A couple of years ago, Mrs. Fiedler bought a cut-out of Abe Lincoln that stood next to our biographies. Over time, he got a little bent up, and we were ready to trash poor Abe. Mrs. Fiedler had the great idea to prank Ms. Schaefer by leaving Lincoln in her classroom. Since then, many teachers have been "Lincolned" by finding Abe in unexpected places. See, librarians CAN have fun! 21 Videoconferences Ms. Fiedler has collaborated with many teachers to videoconference/Skype with people from around the world. A class in India who performed dances and watched our students dance, a woman from a refugee camp, someone from the Immigration Council, a Vietnam Vet, a professor at Rutgers Univ., an expert from WiseOceans. That's just a sampling of how we've helped open the world to our students. 210 Hours of Leopard Time That's just a rough estimate. 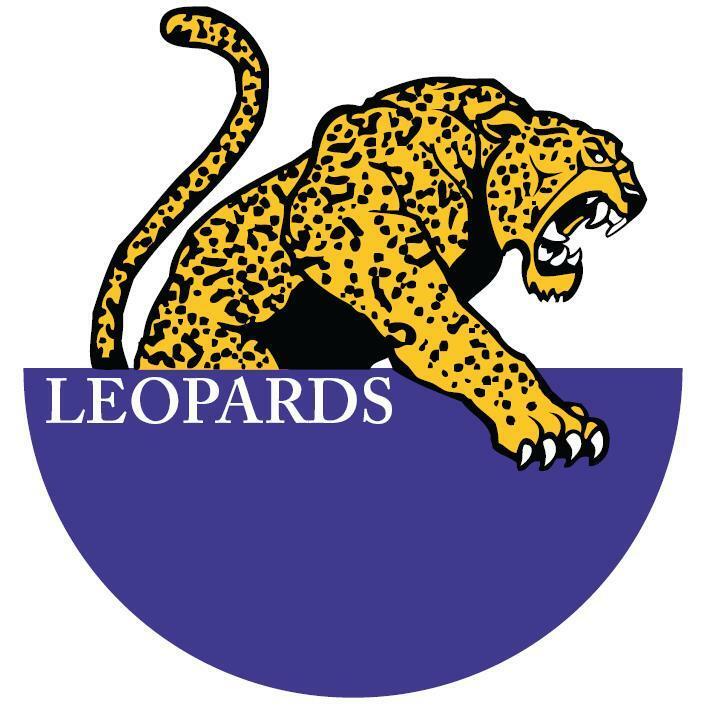 The increase to 30 minutes of remediation/enrichment Leopard Time has meant great things, especially for 6th grade students, whose book checkout is up 42% over this time last year. Some days, Mrs. Mackanic seems buried under books! 57 New Teacher iPads We were able to order, purchase, set up, catalog and distribute new iPads to 57 teachers who indicated they had a plan to use them effectively in student instruction. Those, along with our school's iPads for students, has led to more digital learning with apps and Google Drive. 46 Literacy Lessons In addition to the 40 library orientation classes and 40 tech orientation classes at the beginning of the year, we've taught a bunch of literacy lessons. Some of these have been about finding good online resources, evaluating websites to get the best information, and citing sources, and other have focused on how to choose good literature from the media center. These are all crucial skills our students need to be life long learners. 120 Genius Hours This is just a guess, but we've worked closely with 8th grade language arts students to help make their year-long Genius Hour projects successful. From choosing topics to ideas for a final product, we've instructed students in groups and conferenced one-on-one to help 8th graders aim big and find something they are passionate about. 36 Minions Minded! Mrs. Fiedler may sometimes feel like she's herding cats, but her Media Minion club is packed with the smartest, most tech-minded kids we've ever seem. Whether they are working with Google Cardboard, organizing our carts of wireless laptops, or playing board games at a party, they are always having fun. Four Trailers Outfitted With Technology This is one of those unseen functions we serve. This summer, four mobile classrooms showed up, to help with our overcrowding. No one else realizes this, but someone has to make sure the technology infrastructure is installed, get computers and printers for the classrooms, and oversee that everything gets done so the trailers are fully functional. That someone is us. 99 New CIP Teacher Laptops On a similar note, each certified teacher in WCPSS received a new laptop at the beginning of the school year, purchased with recent bond money. This was a tremendous amount of work for us, as we got them ready to be handed out. We were required to collect two signed forms from every teacher, change the old laptops in our computer inventory and library catalog, add the new laptops to the computer inventory and library catalog, barcode the new ones and check them out to teachers, and get the old ones ready to be used by students. It's one of those things that has to be done, but no one has a clue how much time it takes. 20 Hours of Code Twenty classes came in to participate in Hour of Code, a global movement to get students interested in coding and computer programming. One Gene Yang Author Visit We were so lucky to have the award-winning author of American Born Chinese come to speak with 7th graders who had read his book. We're grateful to Quail Ridge Books and Music who sponsored the visit. The students LOVED his talk and we loved having him at MPMS. Well, that's the whole song, but not the whole of what we've done the first half of the school year. We're not ready to rest on our laurels just yet. Stay tuned for much more from the MPMS media center. I was reading an article in the journal Knowledge Quest, which is published by the American Association of School Librarians, and it started me thinking of the core principles of school libraries and librarians. Although the job duties of school librarians have changed drastically (think technology), our core principles have changed very little. The article is called "The Paradox of Our Profession," and it's by Ann M. Martin and Suzanna L. Panter. 1. School librarians create sanctuaries for our students. For both students and staff, the media center is a place of refuge; from crowds, noise, pressures, and worries. It's a calm and safe place to read, study, and escape from the stresses of the classroom. 2. The school librarian is a collaborator and instructional partner. This is the part of school librarianship that most people don't know about. We are certified teachers and we instruct students daily, team teaching with others and helping students learn to carry out research, develop a love of reading, and use technology wisely. 3. School librarians prepare students for lifelong learning. By introducing students to great literature, teaching them to choose good resources, and helping them develop critical thinking skills, we prepare them to continue to learn throughout their lives. 4. School librarians protect students' right to information. We teach students is to be good users of information. That means they follow copyright law, practice Internet safety, and value opinions and information from different sources. We also advocate for their right to read what they want, locate the information they need, and to be exposed to diverse resources. Our media program has evolved over the years, but the foundations stay the same. In 1899, Melvil Dewey wrote that, "a great librarian must have a clear head, a strong hand, and, above all, a great heart." The more things change, the more they stay the same. Buying new books is one the best parts of my job. There are so many to choose from! I can buy whatever I want! I get to sit and read reviews of new books, dreaming about all the new titles we'll be getting. But, as Spider-man says, with great power comes great responsibility. So much rides on my decisions. From several different aspects. As far as students, I'm often put into a quandary. I have limited funds. Should I buy ten copies of Divergent? What about classics? More nonfiction? Am I limited to only "good literature?" Do I buy copies of books students clamor for, even if they haven't received good reviews? Often, students will be exposed to thought-provoking, excellent literature only if I buy it and make it available to them. (Think about how many adults only buy books some might consider "fluff"--James Patterson, Nora Roberts, etc.) But, if I don't have compelling, interesting, action-filled books many students won't read anything. As far as parents, each family has its own set of values. A book that might be perfectly acceptable to one parent may have content that another would prefer his or her student not read just yet. But, if I don't have reading material for the diverse backgrounds, interests, maturity levels, and reading levels of the entire student body some students (mostly the older kids) will never walk through the door. Do I order John Green's bestseller The Fault in Our Stars? Only if I am willing to allow any student to check it out, regardless of age, since anything else is censorship. So, no, since that book is recommended for older teens, I don't buy it. That's a disappointment to many older students. We tell every single student that they need to learn how to select the right books for themselves, with help from their parents or teacher librarians as needed. We teach lessons on the criteria to use to choose good books. As far as authors and publishers, the choices I make are based on reviews and recommendations from professional library journals, other librarians, and my patrons--our middle school students. This affects people's livelihood, yet I am able to spend only a minute or two on a book review before deciding if I buy the book or not. And, every new book I buy may take the place on the shelf of an older, possibly well-loved books. Do I keep the Green Knowe books? What about Homer Price? The dystopian novel that was popular four years ago? Who knew it was going to be so hard? It's fun or order new books, and fun to open the boxes once they arrive. But each time it makes me a little sad to think about all the great, diverse books out there that go unpurchased because of limited funds that need to be spent serving the most students possible. ​The order is getting turned in soon! In a month or so we'll have some fabulous new titles to choose from.